There’s nothing more confusing in the comics industry than the numbering system. You walk in the store and want to start buying a Batman comic but there’s one on the shelf numbered 236 next to one numbered 9. Or there are three “Batman” titles numbered 1, but their covers are all different. This is part 2 in a crash course on comic book lingo, a follow-up to part 1 where I discussed the different comic book formats and the various ways they’re serialized. Serialized publications necessitate a numbering system. Each comic formats (floppy, graphic novel, trade) has one. With a foot in two worlds, graphic novels are part comic and part novel. Since they’re published like a book, they’re numbered like books—by an International Standard Book Number (ISBN). An issue number is assigned to every floppy published. Numbers are sequential for each title. Each floppy published under the “Batman” title are numbered separately from the ones published under the “The Dark Knight” title. Usually, issue number and month are on the cover of each floppy. The formatting for this has changed over the years and modern comics don’t follow a hard standard. Older comics have a pretty consistent format. The issue and month are in a white box in one of the corners on the cover. Modern comics flex their design muscles in this area. The month of publication is rarely put on the cover and the issue number can be hard to find. For issue number of “Mad Max: Furiosa” is in the bottom left and the month and year are to the right—both placed directly on the cover art. Issue numbers cause the most confusion. There’s an issue 1 of “Wonder Woman” published in July 1942, February 1987, September 2011, and June 2016 — just to name a few. They are differentiated by volume number. Open a floppy and you’ll find everything you want to know about the issue you’re holding in your hand in the publisher’s fine print. * This is the only place you’ll find the volume number. A simple example of volume numbering is “Detective Comics” published by DC Comics. Issue 1 was published March 1937 and is still on-going. This initial long-running series is considered Volume 1. In September 2011, DC Comics paused all of their titles and launched issue 1 of 52 titles as “The New 52.” “Detective Comics” was one of the titles, it ran for 52 issues, and is considered volume 2. A simple example but get this: When DC halted volume 1, it was at issue number 881. They restarted volume 1 after The New 52 finished… with issue 934, skipping 52 numbers. Issues are printed in limited number. Once all of those are sold, a second printing can be ordered, but only if they can be sold. The print number can be found in the UPC code on the front or back cover. A variant is the same issue published with different cover art—the same interior but with a variety of collectible covers. There are several reasons for producing variants. To promote a title, a publisher may ask several well-known artists to create alternative covers. Sometimes variants follow a specific theme or design. 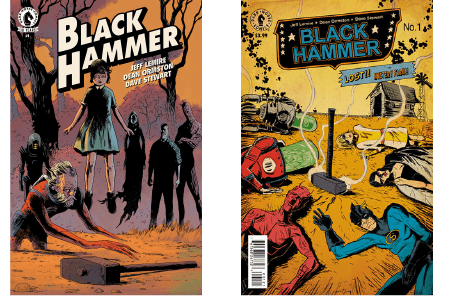 Below is variant 1 and 2 of issue 1 of “Black Hammer.” The artist, Dean Ormston, drew variant 1, and the writer, an artist in his own right, Jeff Lemire, drew variant 2. Trade paperbacks are a compilation of floppies. Trades are distinguished by volume number, a different one from previously discussed. In part 3, I’ll talk about the various job titles that are involved in producing a comic book. In the meantime, if you have any comics you’d like identified let me know and I’ll help if I can. *Thanks to techtre2003 for publishing this information. **The only information not found on the interior credits page is the printing number. This is only in the UPC barcode. Previous postCelebrity Panels: Yay or Nay?